You don’t have to be a veteran to be a good truck driver, but returning service men and women might want to consider choosing the Truck Driver Institutes CDL training program, like Derek Paul did after he left the U.S. Army. Our students are given real world experience behind the wheel of a truck and assisted in finding a good paying job after graduation. Sean Lenhan, a veteran’s employment program manager with the Department of Commerce, is worried that returning service men and women are not adequately being considered for available jobs, even though they possess many highly desirable skills. Those diversified job skills can fit nicely in the commercial trucking industry and many trucking officials are looking for ways to encourage veterans to ponder a career as a professional truck driver. Trucking companies are searching for drivers that have professional training, a strong job history and the type of experience that indicates a long-term fit. 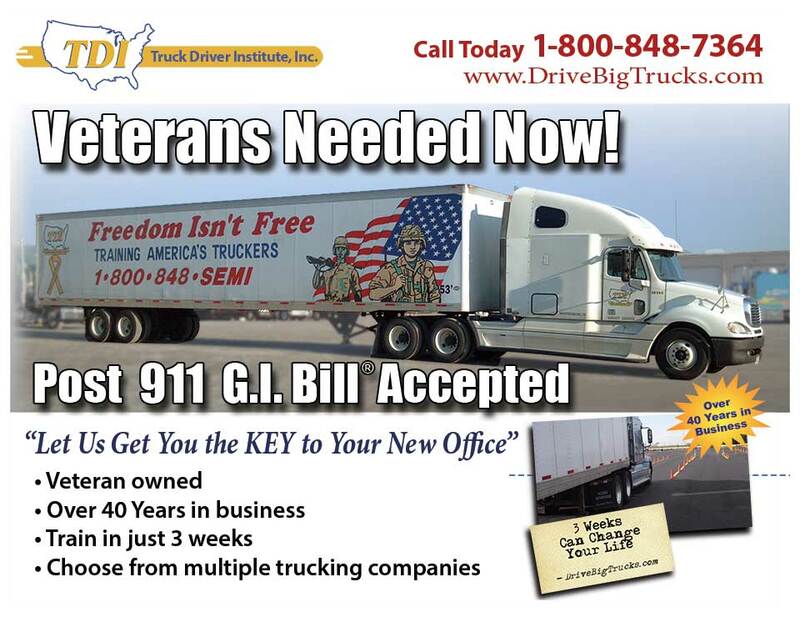 Veterans exceed these requirements and can help meet the growing demand for more professionally trained drivers. You’ve served your country, now it’s time for us to give back. We participate in many of the GI Bill® programs and can work with you on establishing and using those hard-earned benefits towards your new career as a professional truck driver. Be sure to ask our VA Certifying Official for details on our veteran-specific programs. Truck Driver Institute has 12 CDL Training locations throughout the U.S. You will train on late-model trucks and trailers. This ensures that we’ve got a facility close to you with quality, modern equipment available to train you.